With age does come experience but often too an inability to invent. With time comes change, which should be considered a constant. Well along in a brilliant career, Patrick O'Hearn is a new man, but more himself than ever before. 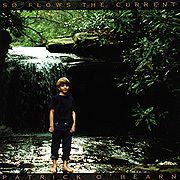 Years in the making, Flow Goes The Current is his album of musical reckoning. O'Hearn's sonic signature has always been brief tight arrangements of clean melodies and harmonies over a determined rhythm section. The dynamic range of his compositions can push the limits of consumer grade audio. With a head for electronics and a heart full of prog-rock, O'Hearn's structures offer both familiarity and his own distinctive sound. Flow Goes The Current is a shift towards a new path. There is more of a human feel - a looser groove - the indeterminacy of the live jam. While this album is a slight departure, the distinctions that make O'Hearn's music so wonderful are still present. The music has presence, it gives place a sound and memory a song. Flow Goes The Current offers powerful music experienced in the mind but felt by the body.